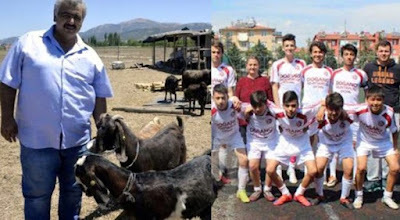 A Turkish club, Gulspor, located in the city of Isparta and one of the oldest clubs in Turkey, founded in 1954, sold 18 young players whose sales money they used to buy 10 goats to win the extra money. sales of milk "which will serve to meet the priority needs of the club. Kenan Buyuklebleb, the president of the Turkish club, said the decision to buy goats was due to lack of funding as there is no government investment or sponsorship essential for the Turkish youth teams playing in the lower leagues. The club earned 15,000 Turkish lira (nearly $ 2,600) after selling 18 young players and plans to draw about 5,000 lire ($ 863) from milk sales to cover club expenses. 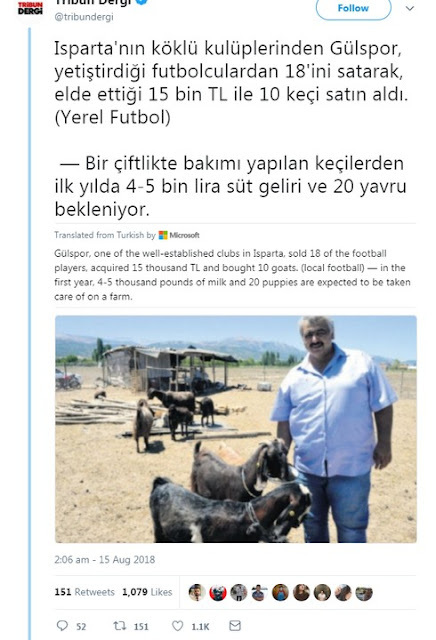 Gulspor, based in the southern city of Isparta, plans to sell goat's milk and goat meat to 140 in 2024. "We have to have a steady income," Buyuklebleb told CNN Turkey. "The funds are overloaded because there is no government support or corporate groups for our clubs, we need to invest more for the kids (competing for the club)." "We have 10 goats and it will be a source of income for young people," said Mr Buyuklebleb, adding that he had acted in the interest of the team. "We think goat farming is profitable, and we bought it to raise better young players." "We expect a profit of 4,000 to 5,000 lire, while the number of goats will increase, and after six years we expect to have 140 goats for the club," he added.